As a local florist based in Enniskillen, we consequently have a lot of knowledge of towns, villages and townlands in Fermanagh. So when placing your order just select the town or village closest to where your flowers are to be sent. Please only select Enniskillen as the town if the address is in Enniskillen and not a outlining village or Town. Waterways Ireland is an Ireland wide implementation body that is responsible for the management, restoration and ongoing development of Irelands many inland waterways. Enniskillen is located in the almost center of Co. Fermanagh between Upper and Lower Lough Erne. As a result, Waterways Ireland has based its headquarters here. Fermanagh is the smallest of the six counties of Northern Ireland. This is true both in terms of population and land mass as Lough Erne dominates most of the county. In fact nearly 30% of the county is lakes and waterways. 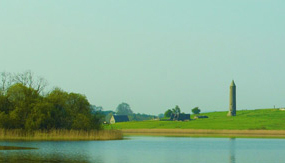 Consequently, the vast rural countryside and expanse of lakes and waterways attribute to Fermanagh being regarded as an outstanding area of beauty. Agriculture is one of the primary industries of Fermanagh. Farmers use the land as grassland for grazing and silage or hay. Crop farming is not very common in Fermanagh mostly due to the maritime temperate oceanic climate. So the most common types of farming that you will find in Fermanagh are beef, dairy, sheep, pigs and poultry. In addition, for tourist information on County Fermanagh including attractions, accommodation and places to eat, see the Fermanagh Lakelands website. As a long established Fermanagh Florist, we have build a strong reputation for excellence in Floristry. Therefore, whether you are looking for Wedding Flower Service or delivery of a bouquet to a friend or loved one in Fermanagh, look no further than Flowers By Sylvia.